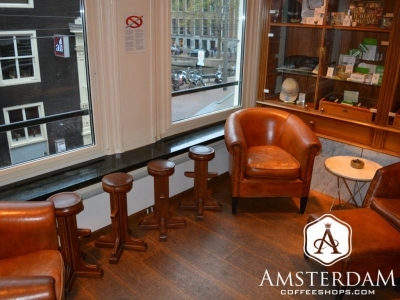 Boerejongens Center coffeeshop is primarily a takeaway establishment located on Utrechtsestraat, to the south of Rembrandtplein. This is a busy part of Amsterdam, with small boutique shops and restaurants lining the streets. The Dutch word “boerenjongen” translates into “farmer boy”. This is one of the four Farmer Boy’s shops. 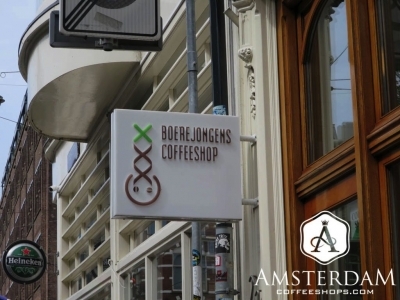 Like its sister shops, the vibe at Boerejongens Center coffeeshop is quite different from most Dutch establishments. It is a modern take on the long-standing part of this city’s culture. The best way to describe it would be to compare it to a medical marijuana dispensary in the USA. Inside, the atmosphere is clinical, with budtenders in white coats greeting visitors from behind a large wood and marble counter. Boerejongens Center is primarily a take-and-go establishment. However, this shop actually has a HORECA license (hotel/restaurant/café). For this, they also serve coffee and snacks, and maintain a separate smoking area. Do you see that staircase in the back? 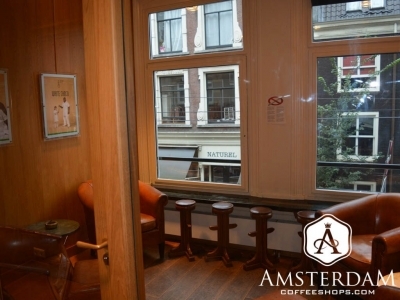 It leads up to Boerejongens’ small but very comfortable smoking lounge. This room is furnished with plush leather chairs, and beautiful wood trim. Enough people know about this room though, so it is often full. 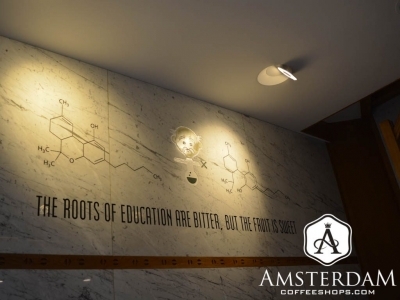 As far as cannabis goes, Boerejongens Center Coffeeshop is connected with Amsterdam Genetics. 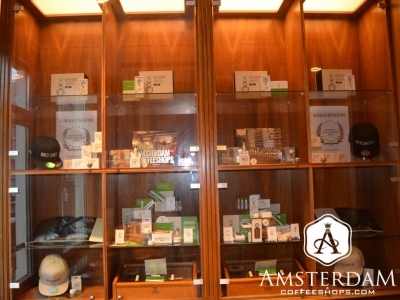 They have been providing modern strains to a good number of the city’s connoisseur coffeeshops. Likewise, this coffeeshop is also regarded as a connoisseur establishment. They have entered many cannabis competitions, and have multiple awards to their credit. The staff is well trained and educated about cannabis, which is really helpful if you have specific requests. The cannabis menu itself is quite robust. First, the weed selection is top notch. You will recognize many of the genetics originating from the USA, which are often embodied in Amsterdam Genetics’ own hybridizations. For hash, they are well known for their “block hashes”. No, we are not taking about brick hash here. Block is a growing technique where the weed used for making hash is grown in sections or blocks. These blocks are strain specific, which allows for a much more refined and controlled end-product. The edibles are also really good here. What is best of all about this shop though is perhaps the pricing. It tends to be reasonable for a connoisseur shop located in the city center. Boerejongens Centre Coffeeshop has the feeling of a pharmacy or American medical marijuana dispensary. The decor inside is elegant, although this is a take-and-go shop only. 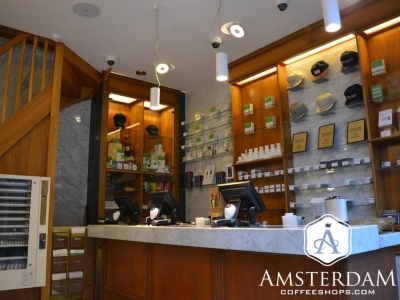 Their cannabis menu is connoisseur grade, however, which makes this establishment worth a visit if you are in the area.